The same fuels are taxed at widely different rates in different countrieswhile different fuels are taxed at widely different rates within and across countries. 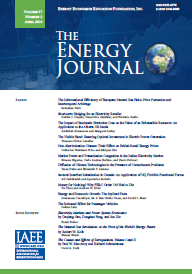 This paper considers what tax theory has to say about efficient energy tax design. The main factors for energy taxes are the optimal tariff argument, the need to correct externalities such as global warming, and second-best considerations for taxing transport fuels as road charges, but these are inadequate to explain current energy taxes. EU energy tax harmonisation and Kyoto suggest that the time is ripe to reform energy taxation. In this paper we explore whether efficiency gains obtained by developing countries participation in emission trading could offset the economic risks that would be incurred by taking on binding commitments when future emissions are uncertain. Such commitments would allow developing countries to participate in emissions trading, which has significantly lower transaction costs than the present Clean Development Mechanism (CDM). However, because future emissions cannot be known, commitments can become more costly for the developing countries than expected. Using a dynamic computable general equilibrium model, we analyse whether the efficiency gains obtained by participating in emissions trading can offset this risk. We find that the efficiency gains that can be obtained by developing countries might not be very large compared to the risks they incur. Developing countries might therefore have good reasons not to embrace binding commitments in order to participate in �cap and trade� emissions trading. This paper attempts to identify whether declining industrial pollution intensities in many European countries are a result of reductions in sectoral emissions intensities (i.e. the effects of regulations and technology) or changes to the product mix (e.g. the decline of heavy industries). This distinction is important since reductions in pollution that are a result of changes to the product mix may simply reflect a transfer of pollution from one country to another, rather than a net reduction. We attempt to resolve this issue by applying the divisia decomposition technique to a new dataset of industry-specific emissions intensities for three common air pollutants, for four European countries. Our results generally indicate the dominance of the sectoral intensity effect although, for the UK in particular, evidence of an increasingly clean product mix is found. Benchmarking of cost efficiency has growing use in energy utility regulation. The state of the art has been limited in many countries by the small size of available national data sets and poor data on capital cost. Data available in the United States place fewer constraints on benchmarking methods. This paper develops an econometric cost benchmarking model for power distribution that is based on U.S. data. The model can address total cost and its major components. Numerous cost drivers are identified. Statistical tests of efficiency hypotheses are performed. The cost performances of utilities are compared to the industry norm. The suitability of the alternative frontier standard in regulatory applications is discussed. Retail real-time pricing (RTP) of electricity � retail pricing that changes hourly to reflect the changing supply/demand balance � is very appealing to economists because it �sends the right price signals.� Economic efficiency gains from RTP, however, are often confused with the short-term wealth transfers from producers to consumers that RTP can create. Abstracting from transfers, I focus on the long-run efficiency gains from adopting RTP in a competitive electricity market. Using simple simulations with realistic parameters, I demonstrate that the magnitude of efficiency gains from RTP is likely to be significant even if demand shows very little elasticity. I also show that �time-of-use� pricing, a simple peak and off-peak pricing system, is likely to capture a very small share of the efficiency gains that RTP offers.